You can make raw hummus with sprouted chickpeas, as well as zucchini, and avocado. 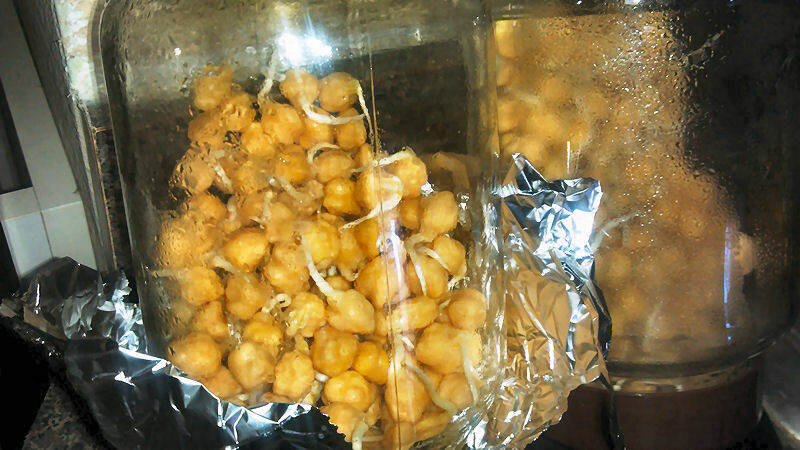 I will post here the directions of how to sprout your own garbanzo/chickpea beans, then also include a raw chickpea hummus recipe. First of all, for sprouting…you DO NOT need a fancy $30 sprouting jar! You can use any large glass jar…and if you are anything like me and somewhat of a pack rat, then chances are you will have a couple empty jars stored away in your house somewhere, for just such an occasion. I use an old instant coffee jar and an old large honey jar. 2) If the jars have metal tops, then all you need is a piece of mesh, a cheesecloth, nut cloth, or…tin foil! 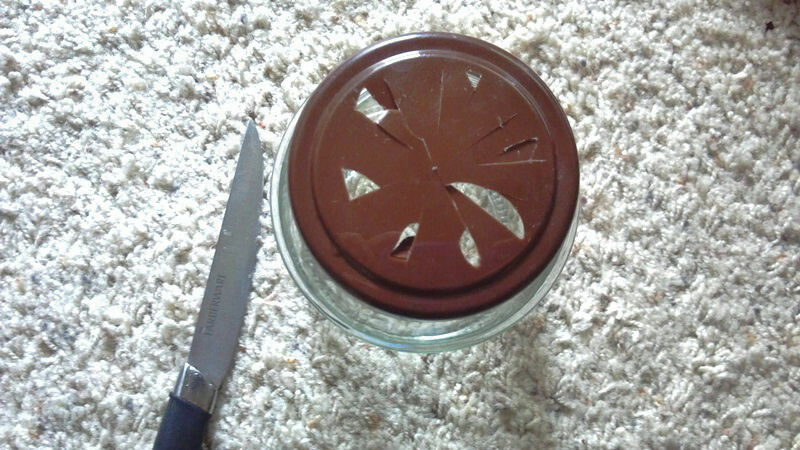 Place the tin foil over the jar in replace of the metal lid cover, secure it with a rubberband, and poke tiny holes into it as well. We are now ready for sprouting! 3) In the jars, place about a cup of chickpeas in each one, with about 2 parts water to 1 part chickpeas. 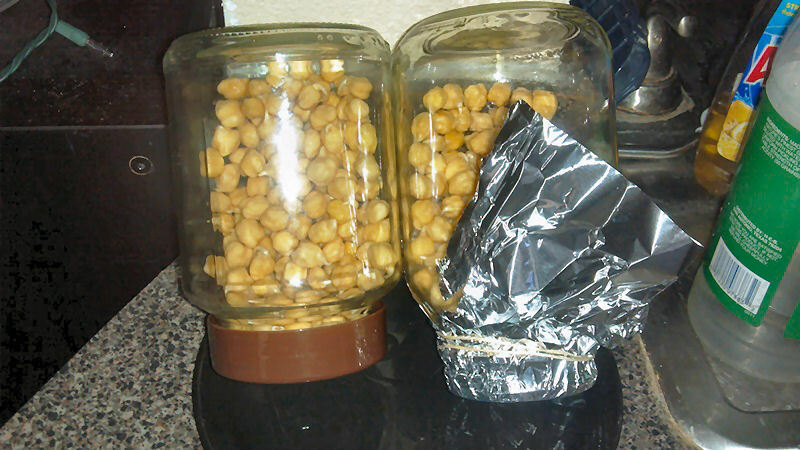 You dont want to fill up the jar with chickpeas completely, as you need to give the beans room to expand, as well for air, and so they aren’t too packed in there. Fill the jar up with water, and leave them to soak overnight, or about 8 to 10 hours. 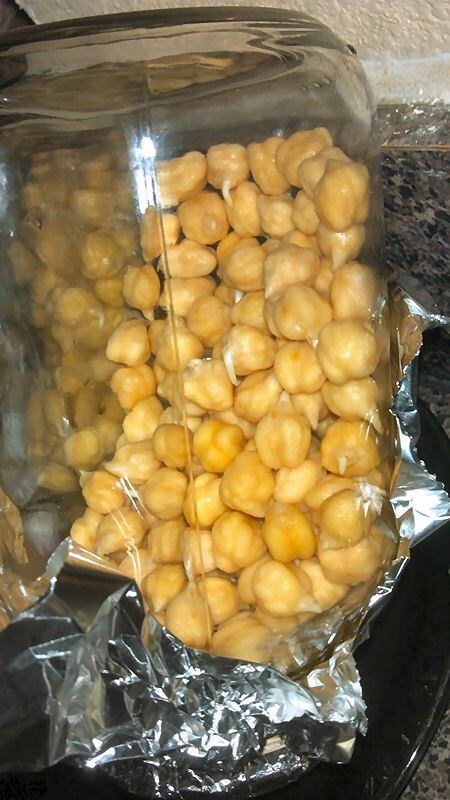 4) In the morning, you should notice that the chickpeas expanded a ton. This is a good thing. Rise out the chickpeas, put them back in the jar, and cover with your tops. Lean them up against the wall at an angle, making sure the chickpeas are dispersed and not all bunched up at the bottom. 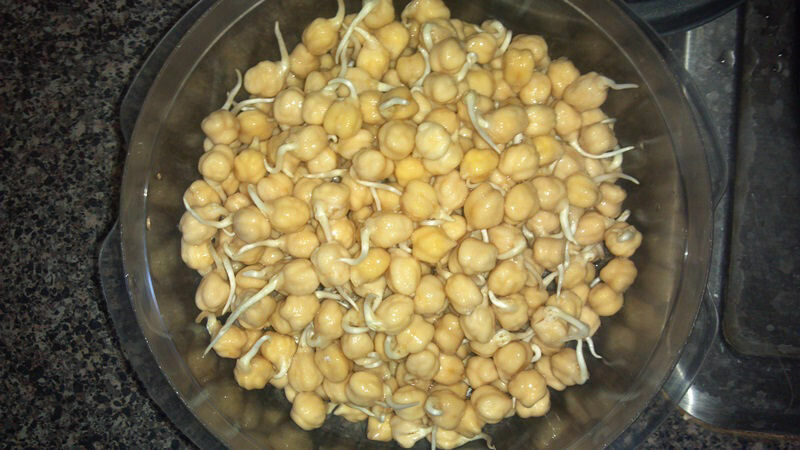 7) Congratulations, you have successfully sprouted chickpeas! Take them out of the jar and store them in a container in the fridge. You can now make raw chickpea hummus with them, add them in salads or eat them like that! Try it, they taste great! Let’s go make raw hummus now!